The following video depicts the Islamic terrorist organization still popularly known as “ISIS” executing reportedly some 1,500 civilians. It is graphic, especially around the 2:30 mark, when the savages start executing the men (the women and children were herded and sold as slaves, sexual or otherwise). 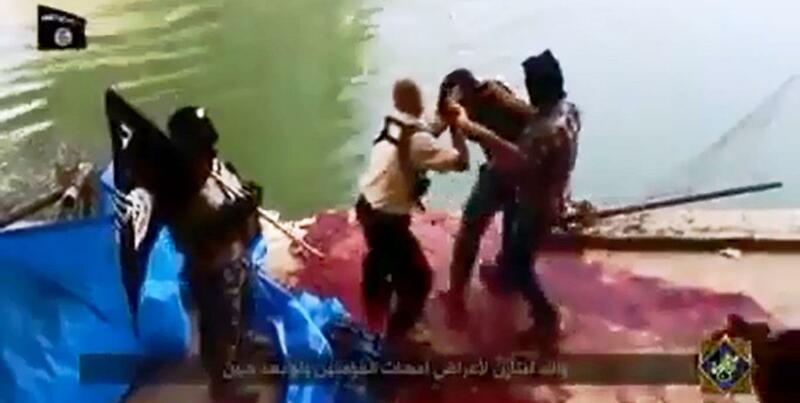 Prior to executing them, the savages of ISIS make it a point to humiliate their captives, slapping them, whipping them, and taunting them. This is a common theme and has appeared in many of ISIS’ propaganda videos. It’s meant to show the “superiority” of Islam, and the inferiority of those who reject it (or are not seemed Islamic enough, such as those being killed, as the word “apostate” was thrown out by ISIS). During the executions, the flag of ISIS — which is really the back flag of Islam, emblazoned with the Arabic shehada, “There is no god but Allah, and Muhammad is his messenger” — is always present, right next to those being executed. This is to stress the fact that they are being slaughtered in the name of Allah and his prophet.